Therapeutic yoga practices bring a stabilizing component to the release of tension and increase mobility within the body. Therapeutic yoga practices help build a balance of tension and integrity within the muscles by working within the range of motion of the muscles; thereby creating more functional movement patterns that help the body move more freely in all activities engaged in. Therapeutic yoga also addresses the relationship between the spine, hips, and shoulders; helping to build increased and balanced stability in these core areas of the body. Ayurveda is a science of self-healing, relieving diseases of both body and mind; bringing physical and psychological well-being. According to Ayurveda we each have a unique elemental nature made up of the five elements (earth, water, fire, air and ether). Our elemental nature, when in balance allows us to live our life with purpose and well-being. At times we may find ourselves in a state of imbalance due to lifestyle choices, dietary and sleeping patterns, even seasonal changes can bring a state of imbalance. Ayurvedic practices help bring our elemental nature back into a state of balance. Therapeutic yoga practices are beneficial for those who want to bring more functional movement to daily activities and other physical activities. It is an excellent practice for those who hold a lot of tension, tightness, and pain in their body due to stress, habitual movement patterns, or injury. It is also beneficial for those who want to maintain or increase flexibility and suppleness throughout the body, as well as build stability in the core areas of the hips, shoulders, and spine. Therapeutic yoga practices will help manage stress, cultivate more energy, improve posture, and promote a greater sense of well-being. Ayurvedic practices are beneficial for those who may be feeling in a state of imbalance mentally, physically, and/or emotionally and are seeking guidance in balancing their elemental nature. Ayurvedic practices help balance metabolism, remove accumulated toxins, calm the nervous system, and build energy and resiliency. Michelle has been a Registered Yoga Teacher (RYT) at the 200 hour level for the last two years. She recently completed her 500 hour level of training as well as becoming certified as an Ayurvedic Yoga Specialist. 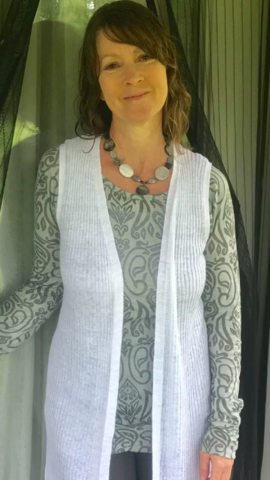 She has been teaching yoga classes in the Chequamegon Bay area for the last two years and is now beginning to offer Ayurvedic classes. Michelle loves spending time in nature; hiking, waterfalling, biking, cross country skiing, snowshoeing, walking and hanging out by the beach, and watching sunrises and sunsets. She enjoys cooking using local foods and foods that she has gathered herself from the area. She especially enjoys spending time with her two grandsons. Michelle also volunteers at the Bad River Boys and Girls Club and Birch Hill Community House in Odanah, WI.